Looking for a fashionable and versatile dress this season. Well look no more! 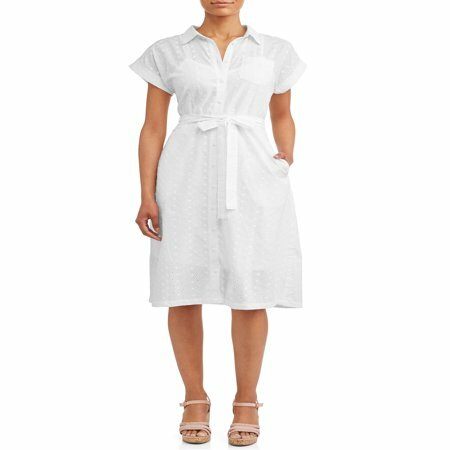 This Time and Tru shirt dress with side pockets will be a great addition to your wardrobe. With its self waisted belt and relaxed fit you will look and feel great while still keeping you comfortable! This dress is the perfect way to stay in style. Can be worn as a dress or layer over legggings. Pair with you favorite sandal for the perfect look! Wow do I love this dress. I have multistripe. Soft cotton/linen feel, beautiful colors, well made, POCKETS!, attractive midi length (which is great for a mom chasing around toddlers), and comfortable. Functional buttons, so nursing friendly. 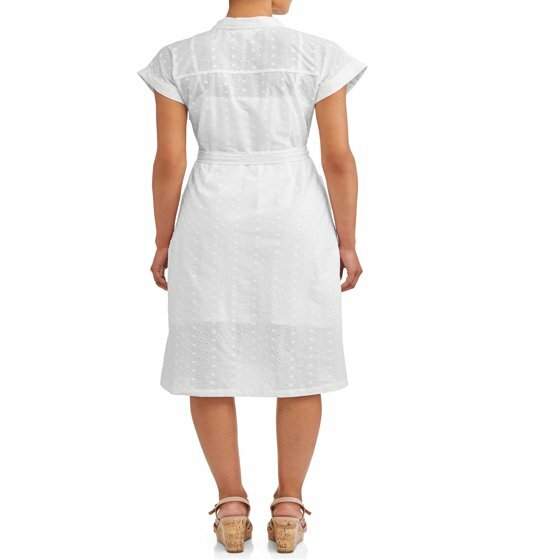 I wore to church today and got several compliments but I could also see myself just wearing this for errands this summer. An effortless, easy, but so stylish look. It does seem a bit big. I'm 6ft tall 170 lb, usually a size 12, and I got a large. It is surprisingly pretty roomy. I wish Walmart would have more of these in stock so I could order the other ones. None of the ones in my size are available to be shipped and the website is directing me to drive 40 minutes to Walmart to look for the dress in person. Not very convenient. Please offer shipping on this dress! Because I love it! Pretty, comfy cotton summer dress! A surprisingly cute, good quality casual dress of comfortable cut and excellent price. Looks great worn with or without the waist tie depending on what suits your body type, I got the navy/white stripe dress which has a linen feel and isnât too see-through to need a chemise. The 100% cotton is excellent for summer, pockets are a bonus. Hope the material and sewing hold up through a wash and dry. I wish this didnât go out of stock online so quickly and offered more colors! For reference I prefer a looser more casual fit in clothing: at 5â7, 150lbs, medium to athletic build (with slight postpartum belly) a large dress fits very generously, medium would be more cleancut. So glad I found this before it went completely out of stock! I love this dress! It got here so fast and it's perfect! !